Jenny Talks: Project 365: Get That Ball! 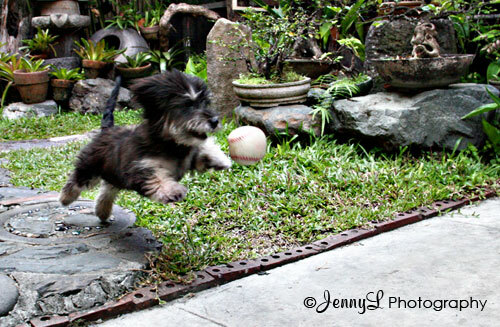 Project 365: Get That Ball! We brought Sophie at the shop and immediately after we arrived, she wanted to go down and play. We threw a ball at her and hurriedly she'll get and bite it. Of course I wanted to freeze her motion and I am so lucky to see her mid air..sooo cute.. I guess, I still need to play more around with my shutter speed settings so that I can capture it sharp. Any tips there?